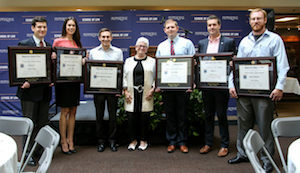 Pepperdine School of Law hosted the third annual Parris Awards at Lon V. Smith Atrium at the Malibu campus on Thursday, April 6. The Parris Awards are celebrated each spring to honor those who exhibit the highest order of the pillars of professionalism. Nominations are based on actual narratives of stories that capture each candidate’s attributes, and faculty and administrators vote to determine the recipients. For additional information about the Parris Awards, visit the School of Law website.